Frankfurt 2009: VW Polo three-door | What Car? Volkswagen's new three-door Polo, which was today unveiled at the Frankfurt motor show. 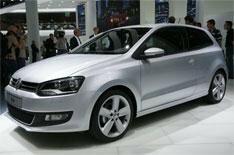 At launch, the three-door Polo will be available with a choice of five engines - three petrols and two diesels. There are two 1.2-litre petrols with either 59bhp or 69bhp and a 83bhp 1.4 petrol. The diesel line-up consists of two 1.6s with either 73bhp or 88bhp. A 104bhp 1.2 turbocharged petrol engine will be offered from early 2010. Just like the five-door version, there are four trim levels - S, SE, Moda and SEL. Prices for the S start at around 9400, while the top-spec SEL model will cost 14,000. Every Polo is fitted with four airbags, stability control and hydraulic brake assist as standard. A CD stereo, speed-sensitive power steering and electric windows are also fitted. SE trim adds air-con, 15-inch alloy wheels, a six-speaker stereo with MP3 connectivity, and body-coloured door handles and mirrors. In top-spec SEL trim, the Polo is fitted with 16-inch alloys, front fog lights, leather trim on the steering wheel, gearshift and handbrake, a multifunction computer and tyre-pressure-warning indicator. Three- and five-door efficient Bluemotion models are expected next spring, with average fuel economy of 85mpg and CO2 emissions of 87g/km. Volkswagen's three-door Polo will cost from 9400 when it goes on sale early next year - that's about 600 less than the five-door version.